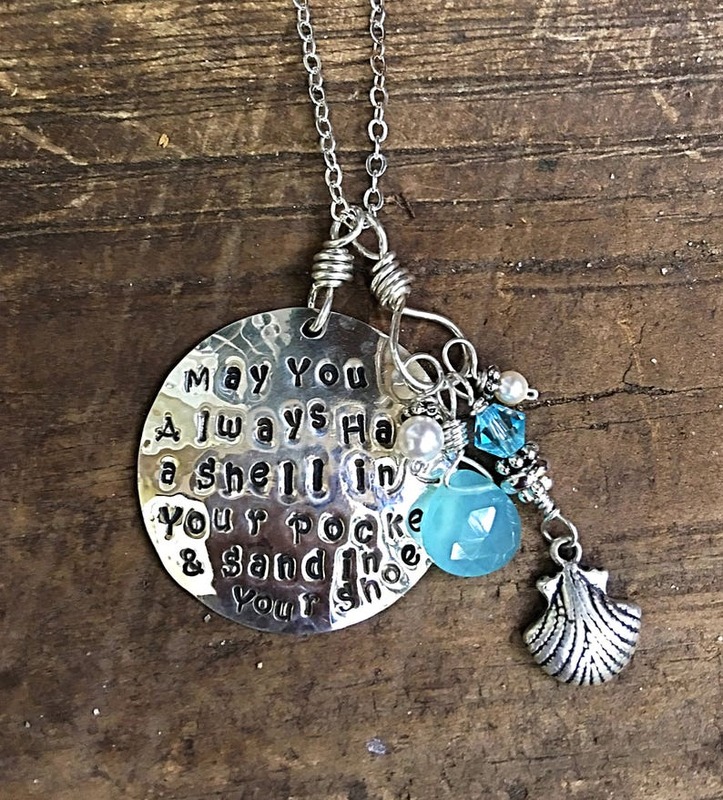 "May you always have a shell in your pocket and sand in your shoes" is hand-stamped on a 1" sterling silver disc. It comes with a charmed tassel including freshwater pearls, a sterling silver sea shell and a semi precious stone briolette (color may vary due to availability). This Newer Version of "Shell in Your Pocket" Necklace is more petite and perfect for everyday summer style.... Suggested Length 16" to 18" However, longer chains are available for an additional fee. MORE INFORMATION: Stamped Pendants are one sided. I am not able to stamp on the backside of any my pieces, unless otherwise noted. Stamping makes the impressions of the letters show on the backside, which means if I stamped on the backside, it would greatly lessen the beauty of your piece. Please remember that since all of my work is handmade to order, therefore, it takes a bit of time to make your pieces. My processing time is usually 1-2 weeks. This does not include the shipping time.